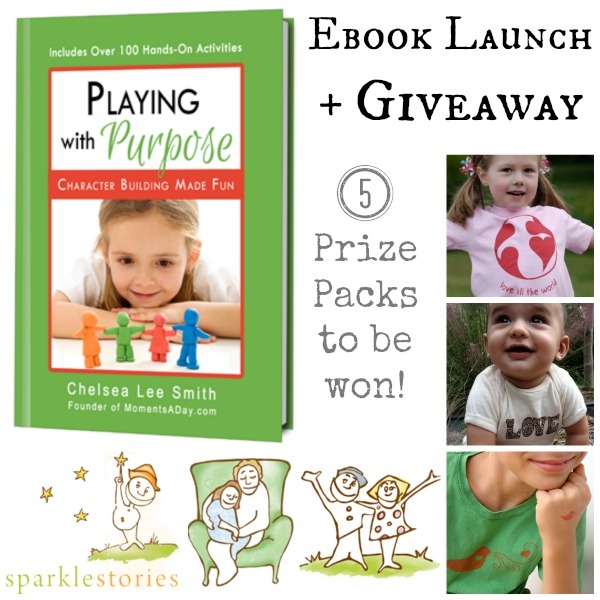 New Ebook Playing with Purpose: Launch and Giveaway! I want my children to build strong character, and I want them to have fun doing it. I want them to enjoy being kind, being responsible, being truthful, and helping others… not just because they know they should “follow the rules” or because mommy told them to. I want them to value having a strong character throughout their entire life, because it brings them joy and fulfillment. My new ebook Playing with Purpose: Character Building Made Fun is designed to help children – especially those under five years old – build positive character traits through simple, enjoyable, and engaging activities. It offers over 100 hands-on playful ideas, split up by character trait (there are 21 altogether) with an easy-to-use checklist format. The activities are numbered for easy reference and there is a column for notes if you would like to extend the activities or record the response of your child to build on later. The activities are meant to help build children’s vocabularies and understanding about what the values mean, as well as give them a positive atmosphere for testing them out. As a result of using the book parents will likely find themselves learning more about character traits and how to implement them into their daily routines as well. At least I have. I find the more I add these character building “moments” into our day, the more positive character traits slip into my mind and daily conversations. It is a beautiful process. I created Playing with Purpose as a resource for families to laugh, learn and grow together. I’ve been very pleased with the feedback so far and truly hope you all will enjoy it. I send it out to each reader with encouragement from the bottom of my heart for the important task we are undertaking: raising the next generation. To read more about the ebook and see a little video I put together about it, head on over to this page. You can also buy your copy there. As this ebook has been a work in progress for many months, I am very happy that it is completed and I would like to celebrate that it is now available! Therefore I have decided to give away 5 free copies of my book and I am pleased to offer even more lovely giveaways from two companies my family loves. Each person who wins a copy of the book will also win one of several prizes from Tender Sapling or Sparkle Stories. Tender Sapling offers a range of children’s clothing, bags, stationary, stickers and tattoos (all environmentally friendly! ), and will soon be adding wall art, bibs, and more styles of clothing and bags to their range. As part of the ebook launch, Tender Sapling will be giving away a T-shirt or bodysuit of the winners’ choice, to two people. There are many sizes, styles, and colors available – browse them here. If you follow me on Instagram, you will probably recognize some of the shirts because my sons wear them all the time! We’ve had ours for quite a while and they are always the first from the drawer to be chosen. Sparkle Stories produces original audio stories for children. Each week Sparkle Stories delivers audio stories to families around the world – stories that are simple, delightful and filled with a sense of wonder. They inspire children to play, to marvel, to laugh, and to be kind. How to enjoy Sparkle Stories? You can subscribe to any of our eight original Story Series, and hear new stories each Friday. Or try one of our many Audio Books. We also have stories for travel, and story packages to give as Gifts. Each week, we share a free story on the Sparkle iTunes Podcast! If you want to read more about how our family has enjoyed Sparkle Stories, check out this review I wrote a while ago. Getting new stories each week is still a cherished part of our weekly routine! What character trait (or virtue) do you want to help your child develop and why? Five winners will be chosen based on originality or creativity. The competition ends on 22 November at 6pm EST. The winners will be contacted by email and announced on this post. Good luck and thank you for participating! A huge THANK YOU to all who participated! Your answers were amazing! Don’t forget to check out more details about my ebook, also! You can find out more (and see a sneak peak of the inside) on this page. This giveaway is open to residents of all countries. You must provide a valid email address when adding your comment. Winners must contact me within 4 days or the prize will be re-drawn. Winners agree to their contact details being passed on to the appropriate company representative so they can claim their prize. Prizes are not redeemable for cash nor are they transferable. Disclosure: I was not compensated to write this post. The giveaway products have been given freely by the companies. I’m very excited about the release of this ebook because I love your blog. It’s so difficult to think of one particular character trait I’d like my little girl to have because there are so many wonderful ways to be. I like to think I value the character traits of being loving and respectful. I hope that my actions and teachings demonstrate ways that we can love and respect ourselves as well as other people and to have a deep sense of compassion. Thank you for this opportunity Chelsea. I would love my 2 boys to develop the virtue of gentleness. Being gentle with others is being kind, being gentle with other’s souls is being truthful, being gentle with the environment is being respectful. If we could all walk this life with gentleness, the world would be a beautiful place. Thanks for all your wonderful ideas and learnings that you share. Such a generous service you do for others. I love the concept of the book! I’d like for my children to learn gratitude. It isn’t easy to teach when the kids these days seem to get everything they want at the drop of a hat. The character trait I want my son to have is compassion. He is only two and is starting to show compassion. I want to empower him in that. There is not much compassion in this world, too many hurting adults or children and not enough compassion reaching out. It breaks my heart. So I want my son to start something great!! Being truthful and responsible. I think they go hand in hand, I want my children to take responsibility for their actions and be truthful when they mess up. I would like to teach my 3 year old son the trait of generosity. Empathy because he seems to struggle with this one the most. It is a skill needed in life to be able to see and understand where another person is comings from even if you don’t agree. I want my two girls to learn the virtue of Integrity. With integrity, several other values tend to fall into line by themselves. Congrats on the launch! I absolutely ADORE your page- my little boy is 7 months but I’m looking forward to using your ideas soon! It is so hard to choose one value… But I would say that I would like him to always see the best in others. I would like to to help my 5 year develop patience. She has many lovely traits already; this one we are working on. Honesty and kindness!!! We have used several plans from Enable Me to Grow in our local childrens class which started with a dominant preschool population. They have grown leaps and bounds and continue to impress me! Having a spirited and strong-willed child, I’d love to have more help on developing patience for me and her, as well as obedience. We’ve been working very hard, sometimes struggling. Obedience is a virtue that is based on so many other virtues, so I hope with your ideas I can help both myself and my daughter to work on that virtue! I would like my children to learn respect. Respect first of all to their Creator. I also want them to honor us as parents, give deference to their sibling and think of others before themselves. I also want them to respect everyone they come in contact with by using manners. I want them to respect animals and the environment. I know a lot of this is more caught than taught, but I hope by my example and teaching moments I can convey this very important character trait so that they will thrive as men and women of God. As a grandmother of twins I would hope to see them develop the character trait of kindness and giving to others…by giving one can learn so much about themselves and others…when you give of yourself you are sharing so much with the world! This is so hard to only name one. I would have to say it was a tie between honesty and trustworthiness. There seem to be so many people who have forgotten what these two words mean in today’s society. I wish for my children, that they acquire strength, resilience and kindness. Life is not always easy, but these qualities are so useful and needed, by women in particular, if we are to become a unified humanity. Gratitude. It is something that is very difficult to teach in our culture. I think it is hard to choose one, probably because so many go hand in hand. If I had to pick just one, it would be kindness. Through kindness there comes patience, understanding, listening to others, love and respect. I can not wait to read this book! I have 4 children ranging in ages from 7months to 15 years. Although I’d love it if all of my children possessed equal amounts of all desirable personality traits, the one that I would be most pleased with is compassion. My two middle littles are 2 and 4 and though I’d love to say that they are the sweetest, kindest, most caring children in the whole wide world, PPPFFFFFTTTTT! These two goobers are downright mean to each other sometimes and, on occasion, mean to others. Ugh! I’m not saying that I’ve raised two holy hellions, they are really good, sweet kids MOST of the time but sometimes I am taken aback by their willingness to throw each other under the bus and stand back pointing and laughing! Help, help, HELP! I hope and pray that my daughter will develop many virtues. There are so many but something that comes to mind is emotional intelligence. I am taking a course in child development this semester and we learned about this. “Emotional intelligence refers to a set of abilities that are key to competent social functioning. These abilities include being able to motivate oneself and persist in the face of frustration, control impulses and delay gratification, identify and understand one’s own and others’ feelings, regulate one’s moods, regulate the expression of emotion in social interactions, and empathize with others’ emotions” (Goleman,1995). I love this because it is for the good of oneself as well as for the good of others. Thank you! I want my child to learn how to work hard. It will help him to work hard, persevere, and have a feeling of accomplish. I want my children to learn to be caring and grateful people. I think these two traits are very important and whether they become important or famous or just an everyday joe, I want them to be good people, to know what it is like to care for others and know they have things to be grateful for no matter what. You have a fantastic website! I am excited to read and implement the ideas in your new book. I want my child to grow up with a genuine care about those around her. I hope my daughter volunteers her time and talents regularly to help improve the lives of others in her community. I want her to love herself and her life – be the peer role-model for others her age. I hope that when she is an adult, I have taught and encouraged her to be kind, listen to others, share ideas and information and be true to herself, always. I have always encouraged my kids to have confidence and will continue to instil this in them. Confidence is such a powerful force and characteristic trait. Through confidence you have self-confidence, tap into your creative side, explore new possibilities, take the necessary risks to achieve your goals and with this self-believe make good sound choices. Kindness and empathy are things I work on developing in my children everyday. Kia ora, I believe it is important to teach our children grace and courtesy. Respect for themselves and their fellow human beings and all of nature is vital to living a hearty life. I would like my boys to learn most about compassion – to be able to understand that different people react and deal with things differently to themselves but this no way makes them better or worse than themselves. I feel that kindness, respect and resilience are also important traits. Loving your work by the way! I would love new and thoughtful resources to help my little friends at creche develop empathy, as I would enjoy some support in passing on this attribute to my grandchildren. I have been surprised and pleased with the discovery of your wonderful website. Empathy, strength and independence. I see empathy as intertwined with love, compassion, kindness, service, gentleness, respect and hope that developing this trait will strengthen so many others. Strength and independence so that this little girl will be empowered as a woman in a world filled some conflicting messages. I think it’s important to teach our children how to serve. When you are eventually ‘free to serve’, you no longer live, but Christ in you! I would like more help in teaching our 5 year old son to be more conscientious of his surroundings. Especially other people’s belongings. Wiow! I never thought of play in that way. That’s a whole new concept. One of the virtues I would like my child to develop is perseverance and resilience as he tends to give up too easily on things. I hope that this book could help him in this area. He is also a speech delayed child, and the activities with vocabulary sound like they could help open up this area as well. I pray for all of my children to have honesty and intergrity. Thank you for the wonderful ideas you share on your blog. Thank you also for this giveaway contest: it prompted some deep thought and some in-depth discussion with my husband about what we want for our boys. What I have come to realise is that the top character trait I would like to help my boys develop is self sufficiency, both internal and external. “Internal” meaning having a deep assurance and self worth that they are good (complete, sufficient) just as they are, and that their joy comes from within rather than being dependent on any external factor. “External” self sufficiency means having that confidence and resourcefulness to tackle any challenge that they encounter, whether it is figuring out a puzzle or realising a lifelong goal. So excited about this book. I would love my girls to develop a positive character and enjoy life and all it offers. If I had to choose just one character trait, I would like our children to learn patience. They’ll need it to help a younger sibling, to grow up, to wait for their spouse, to anticipate the Lord’s return! Thank you! The virtue I would most like to help my daughter develop is awareness. On a personal level this might translate into awareness of her talents and limitations, positive self-talk, the ability to stand up for herself, and cognizance of the influence others can have on her. On a local level, the ability to think through the consequences of her actions can ensure she spreads love and kindness to her friends, family, and community. On a global level, an awareness of different people, diverse cultures, and current events can help her determine her role in the world and how best to contribute her gifts to it. I look forward to sharing your book with my daughter! I have the privilege of having many, many children. I work for an NGO in Gauteng, South Africa and love your website and use many of the activities in our early learning groups. We provide early learning for children in urban and rural communities who have no access to any learning opportunities. We have toy libraries in 5 provinces in SA and give children the opportunity to play in our themed play rooms and have access to educational material and toys. My wish is for these precious children, who at a very young age face heartache, despair and many challenges, that they will learn how to love despite their circumstances, learn to trust , have compassion for others, show empathy, be kind, respectful, work hard at school, believe in themselves, have dreams and goals and that all things are possible but most importantly they can have fun, play and be children regardless of their circumstances. Thank you once again for the fantastic activities and ideas. Hmmmm….what a great question….. I think it’s GRATITUDE, because it’s so foundational to all the other virtues, I believe. And, after reading “One Thousand Gifts,” I’ve started keeping a Gratitude Journal—and have seen it transform me into a person with stronger resilience and trust in God. Integrity because I feel it is extremely important to do the right thing even if nobody is looking. It’s a Corps value I want to pass to my sons. Thank you for all this wonderful work. Teaching values is often so difficult when it seems so few value anything. As to what virtue/value I would like my children to develop… I think empathy/compassion would be at the top. To see and understand another’s view even when it is not our own and to accept it is a gift both to ourselves and the one’s we are trying to understand. I run a Montessori preschool program in my house and I just want help each child discover enough skills to become peaceful loving and kind additions to our world. i want to help my son develop the virtue of patience. i feel like i have been less than patient lately and it absolutely affects how i interact with my family, myself and the world! when i am able to be patient with myself and others i am more likely to be compassionate to my/their feelings and less likely to overreact and say or do something that i feel is not the most loving thing ever. i guess it can be true that we teach what we most need to learn 🙂 thank you for the opportunity and for the wonderful books! sparkle stories sound lovely, too! I think I would like to help my little one to learn to be respectful of everyone, regardless of the gender, age, skin colour, etc. Because each person is unique and is equally as important, even if we do not share the same views on things in life. Respecting others means we can accept that we are different but co-exist peacefully without any negativity. Respecting others means we can learn from everyone’s experiences, good or bad. I would like my 3 year old to learn the character trait patience. We can work on it together. God is definitely strengthening my patience, when my 3 year old repeats the same thing over and over after I have already given him an answer! Haha!